Do You Struggle With People Pleasing, Self Sabotage, and Perfectionism? What you really want is to be able to let go of all the indecision and insecurity and create a healthier body, a better business/career and mind blowing connections in relationships. You know you’re smart enough and are very aware that you are not giving yourself the right to self expression and downright freedom to be happy! So what gives? Why do you feel that you keep trying so hard but can’t attain the level of success, income, physical and mental health you desire? And why can’t you get the respect you feel you deserve in relationships? It’s simple: you’re suffering from good girl syndrome. All of the guilt, self-sabotage, and indecision makes you question if you’re worthy of having the life you truly desire. Sometimes you may even tell yourself your unsure if you deserve it. It’s this underlying pattern that’s keeping you stuck and not creating the freedom and happiness you crave. It’s time to start putting the value on you and stop letting your good girl rule your world. Because though it has good intentions, it’s creating unnecessary stress and suffering and stopping you from being clear about who you are, how you feel physically, and what you have to offer the world. 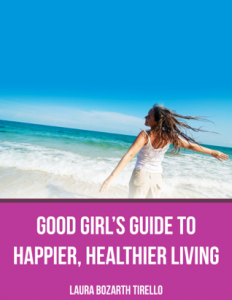 In order to stop living in the shadow of the good girl and start committing to allowing a breakthrough in your confidence, belief, and your abilities you need a plan and support. When you know what you want and understand where you’re going you can do anything! Like help your body heal, build that business, lose weight, and create fulfilling relationships and much more!